Looking to fill those blank walls in your home, but don’t know where to begin? It can be as simple as assessing what you already own and re-imagining the possibilities! Here are 5 wall decor ideas that take your wow factor up a notch without breaking the bank! Think baskets are just for your tabletop? Think again! When a beautifully woven basket is displayed as wall decor, the woven textures and striking patterns take center stage. Additionally, their natural and earthy vibe make woven baskets the perfect complement to almost any other artwork hanging in the same room. The best part? An amazing basket display is one of the most affordable ways to add visual interest to your walls. This vintage set was purchased from Etsy seller The Decor Adobe for $50!! Looking for gorgeous, hand-crafted bowls to display? Check out Local + Lejos, a company that works with artisans from developing communities around the globe. Do you have a hand-loomed blanket, stunning wall tapestry, or phenomenal quilt? Then you have wall decor! Perfect for large areas, these items offer high visual impact without busting your budget. For this couple, I wanted to bring a pop of color to the corner of their family room. Additionally, the goal was to break up the horizontal sight line of a very long wall. 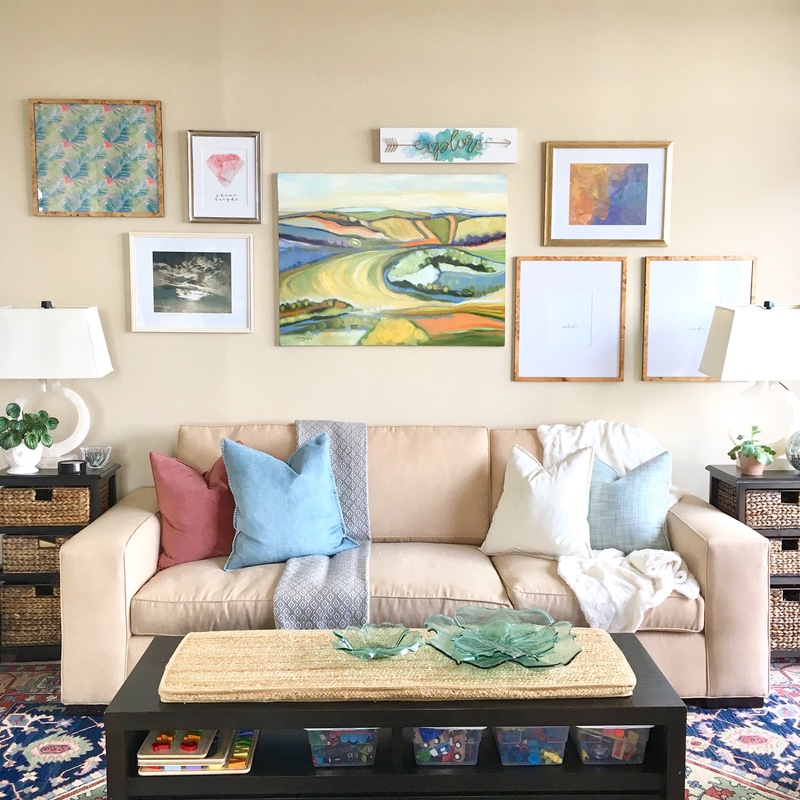 Folding this hand-loomed blanket (that they purchased while traveling) to create a vertical column was the perfect end point to this open concept first floor wall. Looking for more info about HOW to hang a textile like a pro? Click here for 3 Ways to Turn Your Textile in Wall Art. Pressed botanicals add earthy tones and natural textures to this interior space. Are you an avid gardener? Or, perhaps just interested in bringing some of the that outdoorsy goodness inside? Try mounting and framing a selection of pressed botanicals. Stick to a series of leaves with interesting and varied shapes as in the image above for an understated, earthy feel. Looking for wall decor with a pop of color? Try pressing florals in tones that complement the tones in your room. The possibilities are literally endless with this one! And there you have it: five affordable wall decor ideas that you may not have considered! Which one are you ready to try in your space? Let me know in the comments below! Love one (or more!) of the looks mentioned above? Have questions about getting the design just right? Click HERE to contact me and get started creating a “Wow!” wall in your home today!